4/7 Cup of Coffee: Despite the affiliates only winning two of their four games, it was a big day for the top prospects in Boston's farm system. Second-ranked prospect Darwinzon Hernandez (pictured) was dominant in his first Double-A start. He picked up the win with the support of a two-run homer by Bobby Dalbec, ranked fourth by SoxProspects.com. Top ranked Michael Chavis made his first official appearance at second base, his third position played through his first four games. Triston Casas, the #3 prospect, delivered his first professional RBI in the third before winning the game with a 10th-inning sacrifice fly. The PawSox nearly pulled off an improbable rally, posting a five-run seventh inning, but the Mets scratched an eighth-inning score to seal the series win. Michael Chavis got his first start at second base as he continues to work on his positional flexibilty. He did not have a ball hit to him and recorded his only putout on a fifth-inning caught stealing. At the plate, the 2014 first rounder walked and drove in a run with a sacrifice fly. Veterans Rusney Castillo and Mike Miller had two hits apiece. Josh Smith surrendered four runs (three earned) on six hits in 4 2/3 innings. He struck out seven and walked four. Left-hander Josh Taylor was saddled with the loss, giving up a run on two hits in two innings, striking out four. 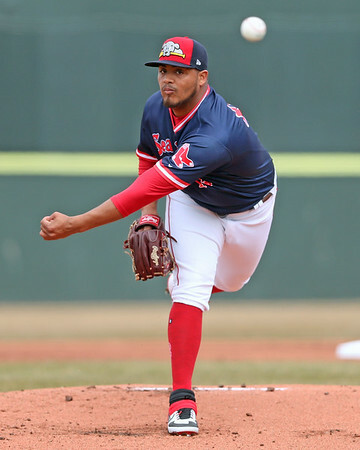 It was an afternoon where nearly everything went right at Hadlock Field, most notably a dominant outing by spring training sensation Darwinzon Hernandez. In his 2019 debut, the lefty struck out 10 in five shutout innings, giving up just two hits and walking four. Hernandez threw 44 of his 74 pitches for strikes and allowed only one ball out of the infield. The bullpen followed with four scoreless inning, including a perfect eighth inning by Durbin Feltman. Hernandez and friends were supported by a big day at the plate from Bobby Dalbec. The third baseman, coming off a 32-homer campaign in 2018, went deep for the first time this season. Dalbec added a pair of singles, and scored two runs. Jantzen Witte added another homer as part of his own three-hit effort, while CJ Chatham ripped his third double of the young season. Enmanuel De Jesus and the Sox came out on the short end of a pitchers' duel. 2018 first-round pick Jackson Kowar shut down the Salem lineup, going five hitless innings. De Jesus allowed two runs on three hits in his 5 2/3, striking out five, walking one, and taking the tough-luck loss. Garrett Benge broke up the no-hit bid with a single in the seventh. Jarren Duran added a base hit, and now has a 14-game hitting streak that stretches back to August of last year. A wild back-and-forth contest at Fluor Field ended when Triston Casas delivered a 10th-inning sacrifice fly. The 2018 first-round pick had driven in his first run as a professional earlier in the afternoon when his single plated Dustin Pedroia. Pedroia, expected to be activated for Boston's home opener on Tuesday, was 0 for 4 with a walk in the third game of his rehab assignment. Brandon Howlett was 2 for 4 with a double, while Kervin Suarez reached base three times with a double, single, and walk. On the mound, Chris Machamer turned in a solid start, giving up a run on four hits in five innings, striking out a pair. Rio Gomez pitched around the automatic baserunner in a scoreless 10th inning to get credit for the win. Player of the Day: There was buzz in Fort Myers about Darwinzon Hernandez potentially making the jump from Double-A to the majors, bringing his tremendous raw stuff to the bullpen. The lefty showed on Sunday why the Red Sox were inclined to be patient and try to develop him as a starter. Hernandez struck out 10 of the 20 batters he faced in five shutout innings, with only one ball leaving the infield. Going back to the start of July 2018, Hernandez has a microscopic 1.36 ERA, with 80 strikeouts in 53 innings.